During attitude instrument training, two fundamental flight skills must be developed. They are instrument cross-check and instrument interpretation, both resulting in positive aircraft control. Although these skills are learned separately and in deliberate sequence, a measure of proficiency in precision flying is the ability to integrate these skills into unified, smooth, positive control responses to maintain any prescribed flightpath. The first fundamental skill is cross-checking (also called “scanning” or “instrument coverage”). Cross-checking is the continuous and logical observation of instruments for attitude and performance information. 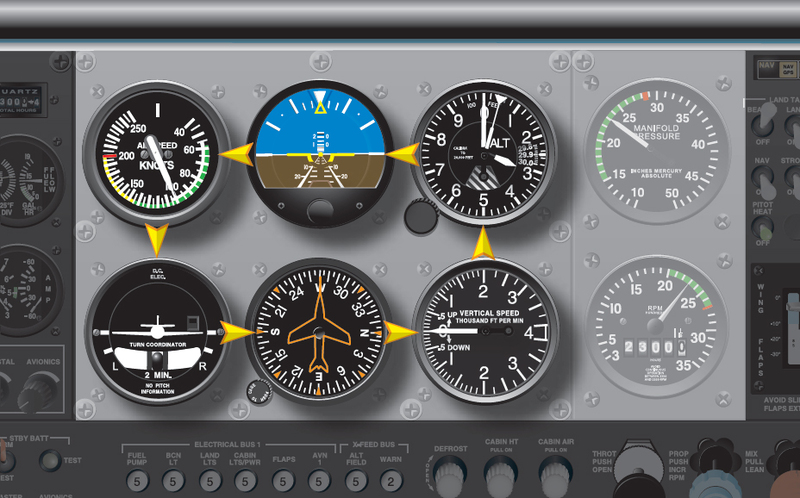 In attitude instrument flying, the pilot maintains an attitude by reference to instruments, producing the desired result in performance. Observing and interpreting two or more instruments to determine attitude and performance of an aircraft is called cross-checking. Although no specific method of cross-checking is recommended, those instruments that give the best information for controlling the aircraft in any given maneuver should be used. The important instruments are the ones that give the most pertinent information for any particular phase of the maneuver. These are usually the instruments that should be held at a constant indication. The remaining instruments should help maintain the important instruments at the desired indications, which is also true in using the emergency panel. Cross-checking is mandatory in instrument flying. In visual flight, a level attitude can be maintained by outside references. 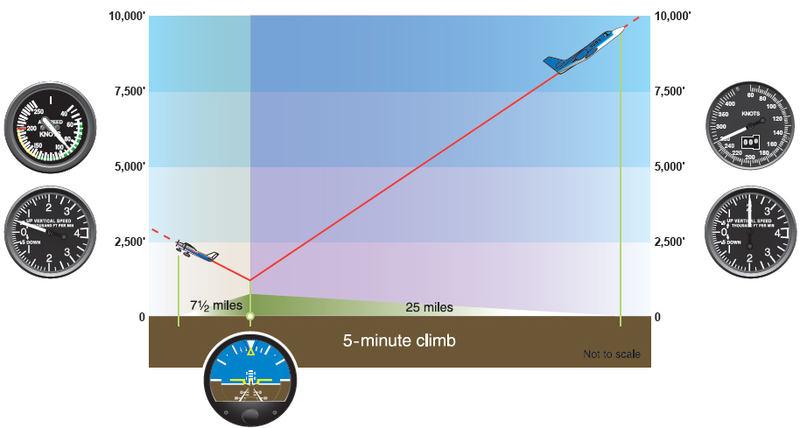 However, even then the altimeter must be checked to determine if altitude is being maintained. Due to human error, instrument error, and airplane performance differences in various atmospheric and loading conditions, it is impossible to establish an attitude and have performance remain constant for a long period of time. These variables make it necessary for the pilot to constantly check the instruments and make appropriate changes in airplane attitude using cross-checking of instruments. Examples of cross-checking are explained in the following paragraphs. This cross-checking method gives equal weight to the information from each instrument, regardless of its importance to the maneuver being performed. However, this method lengthens the time it takes to return to an instrument critical to the successful completion of the maneuver. A beginner might cross-check rapidly, looking at the instruments without knowing exactly what to look for. With increasing experience in basic instrument maneuvers and familiarity with the instrument indications associated with them, a pilot learns what to look for, when to look for it, and what response to make. As proficiency increases, a pilot cross-checks primarily from habit, suiting scanning rate and sequence to the demands of the flight situation. Failure to maintain basic instrument proficiency through practice can result in many of the following common scanning errors, both during training and at any subsequent time. Fixation, or staring at a single instrument, usually occurs for a reason, but has poor results. For example, a pilot may stare at the altimeter reading 200 feet below the assigned altitude, and wonder how the needle got there. While fixated on the instrument, increasing tension may be unconsciously exerted on the controls, which leads to an unnoticed heading change that leads to more errors. Another common fixation is likely when initiating an attitude change. For example, a shallow bank is established for a 90° turn and, instead of maintaining a cross-check of other pertinent instruments, the pilot stares at the heading indicator throughout the turn. Since the aircraft is turning, there is no need to recheck the heading indicator for approximately 25 seconds after turn entry. The problem here may not be entirely due to cross-check error. It may be related to difficulties with instrument interpretation. Uncertainty about reading the heading indicator (interpretation) or uncertainty because of inconsistency in rolling out of turns (control) may cause the fixation. Omission of an instrument from a cross-check is another likely fault. It may be caused by failure to anticipate significant instrument indications following attitude changes. For example, in a roll-out from a 180° steep turn, straight-and-level flight is established with reference only to the attitude indicator, and the pilot neglects to check the heading indicator for constant heading information. Because of precession error, the attitude indicator temporarily shows a slight error, correctable by quick reference to the other flight instruments. Emphasis on a single instrument, instead of on the combination of instruments necessary for attitude information, is an understandable fault during the initial stages of training. It is a natural tendency to rely on the instrument that is most readily understood, even when it provides erroneous or inadequate information. Reliance on a single instrument is poor technique. For example, a pilot can maintain reasonably close altitude control with the attitude indicator, but cannot hold altitude with precision without including the altimeter in the cross-check. The second fundamental skill, instrument interpretation, requires more thorough study and analysis. It begins by understanding each instrument’s construction and operating principles. Then, this knowledge must be applied to the performance of the aircraft being flown, the particular maneuvers to be executed, the cross-check and control techniques applicable to that aircraft, and the flight conditions. For example, a pilot uses full power in a small airplane for a 5-minute climb from near sea level, and the attitude indicator shows the miniature aircraft two bar widths (twice the thickness of the miniature aircraft wings) above the artificial horizon. [Figure 6-20] The airplane is climbing at 500 fpm as shown on the VSI, and at airspeed of 90 knots, as shown on the airspeed indicator. With the power available in this particular airplane and the attitude selected by the pilot, the performance is shown on the instruments. Now, set up the identical picture on the attitude indicator in a jet airplane. 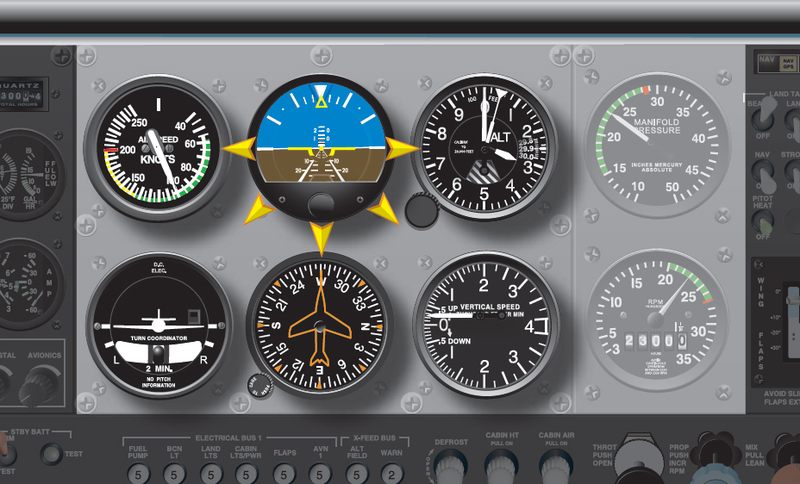 With the same airplane attitude as shown in the first example, the VSI in the jet reads 2,000 fpm and the airspeed indicator reads 250 knots. As the performance capabilities of the aircraft are learned, a pilot interprets the instrument indications appropriately in terms of the attitude of the aircraft. 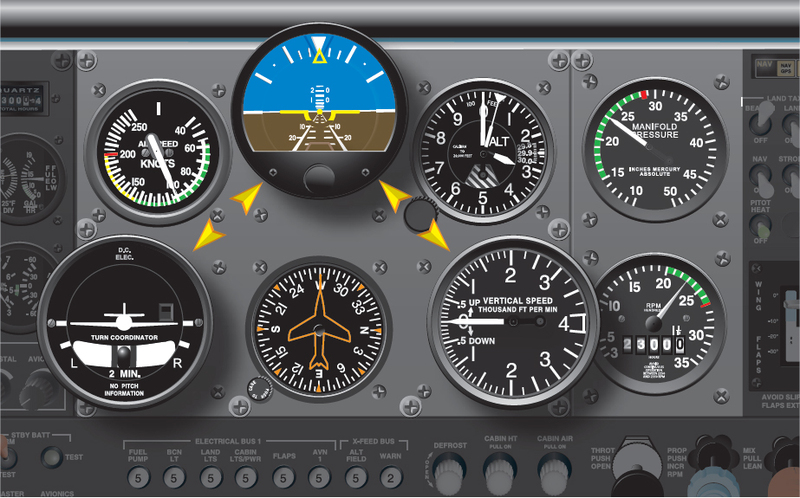 If the pitch attitude is to be determined, the airspeed indicator, altimeter, VSI, and attitude indicator provide the necessary information. If the bank attitude is to be determined, the heading indicator, turn coordinator, and attitude indicator must be interpreted. For each maneuver, learn what performance to expect and the combination of instruments to be interpreted in order to control aircraft attitude during the maneuver. It is the two fundamental flight skills, instrument cross-check and instrument interpretation, that provide the smooth and seamless control necessary for basic instrument flight as discussed at the beginning of the section.